In the news, Boeing (an aircraft maker) has been “targeted by a WannaCry virus attack”. Phrased this way, it’s implausible. There are no new attacks targeting people with WannaCry. There is either no WannaCry, or it’s simply a continuation of the attack from a year ago. It’s possible what happened is that an anti-virus product called a new virus “WannaCry”. Virus families are often related, and sometimes a distant relative gets called the same thing. I know this watching the way various anti-virus products label my own software, which isn’t a virus, but which virus writers often include with their own stuff. The Lazarus group, which is believed to be responsible for WannaCry, have whole virus families like this. Thus, just because an AV product claims you are infected with WannaCry doesn’t mean it’s the same thing that everyone else is calling WannaCry. Famously, WannaCry was the first virus/ransomware/worm that used the NSA ETERNALBLUE exploit. Other viruses have since added the exploit, and of course, hackers use it when attacking systems. It may be that a network intrusion detection system detected ETERNALBLUE, which people then assumed was due to WannaCry. It may actually have been an nPetya infection instead (nPetya was the second major virus/worm/ransomware to use the exploit). Or it could be the real WannaCry, but it’s probably not a new “attack” that “targets” Boeing. Instead, it’s likely a continuation from WannaCry’s first appearance. WannaCry is a worm, which means it spreads automatically after it was launched, for years, without anybody in control. Infected machines still exist, unnoticed by their owners, attacking random machines on the Internet. If you plug in an unpatched computer onto the raw Internet, without the benefit of a firewall, it’ll get infected within an hour. However, the Boeing manufacturing systems that were infected were not on the Internet, so what happened? The narrative from the news stories imply some nefarious hacker activity that “targeted” Boeing, but that’s unlikely. We have now have over 15 years of experience with network worms getting into strange places disconnected and even “air gapped” from the Internet. The most common reason is laptops. Somebody takes their laptop to some place like an airport WiFi network, and gets infected. They put their laptop to sleep, then wake it again when they reach their destination, and plug it into the manufacturing network. At this point, the virus spreads and infects everything. This is especially the case with maintenance/support engineers, who often have specialized software they use to control manufacturing machines, for which they have a reason to connect to the local network even if it doesn’t have useful access to the Internet. A single engineer may act as a sort of Typhoid Mary, going from customer to customer, infecting each in turn whenever they open their laptop. Another cause for infection is virtual machines. A common practice is to take “snapshots” of live machines and save them to backups. Should the virtual machine crash, instead of rebooting it, it’s simply restored from the backed up running image. If that backup image is infected, then bringing it out of sleep will allow the worm to start spreading. Jake Williams claims he’s seen three other manufacturing networks infected with WannaCry. Why does manufacturing seem more susceptible? The reason appears to be the “killswitch” that stops WannaCry from running elsewhere. The killswitch uses a DNS lookup, stopping itself if it can resolve a certain domain. Manufacturing networks are largely disconnected from the Internet enough that such DNS lookups don’t work, so the domain can’t be found, so the killswitch doesn’t work. Thus, manufacturing systems are no more likely to get infected, but the lack of killswitch means the virus will continue to run, attacking more systems instead of immediately killing itself. One solution to this would be to setup sinkhole DNS servers on the network that resolve all unknown DNS queries to a single server that logs all requests. This is trivially setup with most DNS servers. The logs will quickly identify problems on the network, as well as any hacker or virus activity. The side effect is that it would make this killswitch kill WannaCry. WannaCry isn’t sufficient reason to setup sinkhole servers, of course, but it’s something I’ve found generally useful in the past. Something obviously happened to the Boeing plant, but the narrative is all wrong. Words like “targeted attack” imply things that likely didn’t happen. Facts are so loose in cybersecurity that it may not have even been WannaCry. The real story is that the original WannaCry is still out there, still trying to spread. Simply put a computer on the raw Internet (without a firewall) and you’ll get attacked. That, somehow, isn’t news. Instead, what’s news is whenever that continued infection hits somewhere famous, like Boeing, even though (as Boeing claims) it had no important effect. Last month, the US government officially “attributed” the Wannacry ransomware worm to North Korea. This attribution has three flaws, which are a good lesson for attribution in general. The most important fact about Wannacry is that it was an accident. We’ve had 30 years of experience with Internet worms teaching us that worms are always accidents. While launching worms may be intentional, their effects cannot be predicted. While they appear to have targets, like Slammer against South Korea, or Witty against the Pentagon, further analysis shows this was just a random effect that was impossible to predict ahead of time. Only in hindsight are these effects explainable. We should hold those causing accidents accountable, too, but it’s a different accountability. The U.S. has caused more civilian deaths in its War on Terror than the terrorists caused triggering that war. But we hold these to be morally different: the terrorists targeted the innocent, whereas the U.S. takes great pains to avoid civilian casualties. Since we are talking about blaming those responsible for accidents, we also must include the NSA in that mix. The NSA created, then allowed the release of, weaponized exploits. That’s like accidentally dropping a load of unexploded bombs near a village. When those bombs are then used, those having lost the weapons are held guilty along with those using them. Yes, while we should blame the hacker who added ETERNAL BLUE to their ransomware, we should also blame the NSA for losing control of ETERNAL BLUE. Was it North Korea, or hackers affilliated with North Korea? These aren’t the same. It’s hard for North Korea to have hackers of its own. It doesn’t have citizens who grow up with computers to pick from. Moreover, an internal hacking corps would create tainted citizens exposed to dangerous outside ideas. Update: Some people have pointed out that Kim Il-sung University in the capital does have some contact with the outside world, with academics granted limited Internet access, so I guess some tainting is allowed. Still, what we know of North Korea hacking efforts largley comes from hackers they employ outside North Korea. It was the Lazurus Group, outside North Korea, that did Wannacry. Instead, North Korea develops external hacking “assets”, supporting several external hacking groups in China, Japan, and South Korea. This is similar to how intelligence agencies develop human “assets” in foreign countries. While these assets do things for their handlers, they also have normal day jobs, and do many things that are wholly independent and even sometimes against their handler’s interests. For example, this Muckrock FOIA dump shows how “CIA assets” independently worked for Castro and assassinated a Panamanian president. That they also worked for the CIA does not make the CIA responsible for the Panamanian assassination. That CIA/intelligence assets work this way is well-known and uncontroversial. The fact that countries use hacker assets like this is the controversial part. These hackers do act independently, yet we refuse to consider this when we want to “attribute” attacks. We have far better attribution for the nPetya attacks. It was less accidental (they clearly desired to disrupt Ukraine), and the hackers were much closer to the Russian government (Russian citizens). Yet, the Trump administration isn’t fighting Russia, they are fighting North Korea, so they don’t officially attribute nPetya to Russia, but do attribute Wannacry to North Korea. Trump is in conflict with North Korea. He is looking for ways to escalate the conflict. Attributing Wannacry helps achieve his political objectives. That it was blatantly politics is demonstrated by the way it was released to the press. It wasn’t released in the normal way, where the administration can stand behind it, and get challenged on the particulars. Instead, it was pre-released through the normal system of “anonymous government officials” to the NYTimes, and then backed up with op-ed in the Wall Street Journal. The government leaks information like this when it’s weak, not when its strong. The proper way is to release the evidence upon which the decision was made, so that the public can challenge it. Among the questions the public would ask is whether it they believe it was North Korea’s intention to cause precisely this effect, such as disabling the British NHS. Or, whether it was merely hackers “affiliated” with North Korea, or hackers carrying out North Korea’s orders. We cannot challenge the government this way because the government intentionally holds itself above such accountability. We believe hacking groups tied to North Korea are responsible for Wannacry. Yet, even if that’s true, we still have three attribution problems. We still don’t know if that was intentional, in pursuit of some political goal, or an accident. We still don’t know if it was at the direction of North Korea, or whether their hacker assets acted independently. We still don’t know if the government has answers to these questions, or whether it’s exploiting this doubt to achieve political support for actions against North Korea. Proponents argue that this would allow patches to be developed, which in turn would help ensure that networks are secure. On its face, this argument might seem to make sense — but it is a gross oversimplification of the problem, one that not only would not have the desired effect but that also would be dangerous. Malicious software like WannaCry and Petya is a scourge in our digital lives, and we need to take concerted action to protect ourselves. That action must be grounded in an accurate understanding of how the vulnerability ecosystem works. Software vendors need to continue working to build better software and to provide patching support for software deployed in critical infrastructure. Customers need to budget and plan for upgrades as part of the going-in cost of IT, or for compensatory measures when upgrades are impossible. Those who discover vulnerabilities need to responsibly disclose them or, if they are retained for national security purposes, adequately safeguard them. And the partnership of intelligence, law enforcement and industry needs to work together to identify and disrupt actors who use these vulnerabilities for their criminal and destructive ends. No single set of actions will solve the problem; we must work together to protect ourselves. As for blame, we should place it where it really lies: on the criminals who intentionally and maliciously assembled this destructive ransomware and released it on the world. I don’t think anyone would argue with any of that, either. The question is whether the US government should prioritize attack over defense, and security over surveillance. Disclosing, especially in a world where the secrecy of zero-day vulnerabilities is so fragile, greatly improves the security of our critical systems. NonPetya: no evidence it was a "smokescreen"
Many well-regarded experts claim that the not-Petya ransomware wasn’t “ransomware” at all, but a “wiper” whose goal was to destroy files, without any intent at letting victims recover their files. I want to point out that there is no real evidence of this. Certainly, things look suspicious. For one thing, it certainly targeted the Ukraine. For another thing, it made several mistakes that prevent them from ever decrypting drives. Their email account was shutdown, and it corrupts the boot sector. But these things aren’t evidence, they are problems. They are things needing explanation, not things that support our preferred conspiracy theory. The simplest, Occam’s Razor explanation explanation is that they were simple mistakes. Such mistakes are common among ransomware. We think of virus writers as professional software developers who thoroughly test their code. Decades of evidence show the opposite, that such software is of poor quality with shockingly bad bugs. It’s true that effectively, nPetya is a wiper. Matthieu Suiche‏ does a great job describing one flaw that prevents it working. @hasherezade does a great job explaining another flaw. But best explanation isn’t that this is intentional. Even if these bugs didn’t exist, it’d still be a wiper if the perpetrators simply ignored the decryption requests. They need not intentionally make the decryption fail. Thus, the simpler explanation is that it’s simply a bug. Ransomware authors test the bits they care about, and test less well the bits they don’t. It’s quite plausible to believe that just before shipping the code, they’d add a few extra features, and forget to regression test the entire suite. I mean, I do that all the time with my code. Some have pointed to the sophistication of the code as proof that such simple errors are unlikely. This isn’t true. While it’s more sophisticated than WannaCry, it’s about average for the current state-of-the-art for ransomware in general. What people think of, such the Petya base, or using PsExec to spread throughout a Windows domain, is already at least a year old. Indeed, the use of PsExec itself is a bit clumsy, when the code for doing the same thing is already public. It’s just a few calls to basic Windows networking APIs. A sophisticated virus would do this itself, rather than clumsily use PsExec. Infamy doesn’t mean skill. People keep making the mistake that the more widespread something is in the news, the more skill, the more of a “conspiracy” there must be behind it. This is not true. Virus/worm writers often do newsworthy things by accident. Indeed, the history of worms, starting with the Morris Worm, has been things running out of control more than the author’s expectations. What makes nPetya newsworthy isn’t the EternalBlue exploit or the wiper feature. Instead, the creators got lucky with MeDoc. The software is used by every major organization in the Ukraine, and at the same time, their website was horribly insecure — laughably insecure. Furthermore, it’s autoupdate feature didn’t check cryptographic signatures. No hacker can plan for this level of widespread incompetence — it’s just extreme luck. Thus, the effect of bumbling around is something that hit the Ukraine pretty hard, but it’s not necessarily the intent of the creators. It’s like how the Slammer worm hit South Korea pretty hard, or how the Witty worm hit the DoD pretty hard. These things look “targeted”, especially to the victims, but it was by pure chance (provably so, in the case of Witty). Certainly, MeDoc was targeted. But then, targeting a single organization is the norm for ransomware. They have to do it that way, giving each target a different Bitcoin address for payment. That it then spread to the entire Ukraine, and further, is the sort of thing that typically surprises worm writers. Finally, there’s little reason to believe that there needs to be a “smokescreen”. Russian hackers are targeting the Ukraine all the time. Whether Russian hackers are to blame for “ransomware” vs. “wiper” makes little difference. We know that Russian hackers are constantly targeting the Ukraine. Therefore, the theory that this was nPetya’s goal all along, to destroy Ukraines computers, is a good one. Yet, there’s no actual “evidence” of this. nPetya’s issues are just as easily explained by normal software bugs. The smokescreen isn’t needed. The boot record bug isn’t needed. The single email address that was shutdown isn’t significant, since half of all ransomware uses the same technique. The experts who disagree with me are really smart/experienced people who you should generally trust. It’s just that I can’t see their evidence. Update: I wrote another blogpost about “survivorship bias“, refuting the claim by many experts talking about the sophistication of the spreading feature. Update: comment asks “why is there no Internet spreading code?”. The answer is “I don’t know”, but unanswerable questions aren’t evidence of a conspiracy. “What aren’t there any stars in the background?” isn’t proof the moon landings are fake, such because you can’t answer the question. One guess is that you never want ransomware to spread that far, until you’ve figured out how to get payment from so many people. Is Continuing to Patch Windows XP a Mistake? Last week, Microsoft issued a security patch for Windows XP, a 16-year-old operating system that Microsoft officially no longer supports. Last month, Microsoft issued a Windows XP patch for the vulnerability used in WannaCry. The zero-day flaw and its exploitation is unfortunate, and Microsoft is likely smarting from government calls for people to stop using Internet Explorer. The company had three ways it could respond. It could have done nothing­ — stuck to its guns, maintained that the end of support means the end of support, and encouraged people to move to a different platform. It could also have relented entirely, extended Windows XP’s support life cycle for another few years and waited for attrition to shrink Windows XP’s userbase to irrelevant levels. Or it could have claimed that this case is somehow “special,” releasing a patch while still claiming that Windows XP isn’t supported. None of these options is perfect. A hard-line approach to the end-of-life means that there are people being exploited that Microsoft refuses to help. A complete about-turn means that Windows XP will take even longer to flush out of the market, making it a continued headache for developers and administrators alike. But the option Microsoft took is the worst of all worlds. It undermines efforts by IT staff to ditch the ancient operating system and undermines Microsoft’s assertion that Windows XP isn’t supported, while doing nothing to meaningfully improve the security of Windows XP users. The upside? It buys those users at best a few extra days of improved security. It’s hard to say how that was possibly worth it. At least Microsoft has security engineers on staff that can write a patch for Windows XP. There will be no one able to write patches for your 16-year-old thermostat and refrigerator, even assuming those devices can accept security patches. Though the assessment is not conclusive, the preponderance of the evidence points to Pyongyang. It includes the range of computer Internet protocol addresses in China historically used by the RGB, and the assessment is consistent with intelligence gathered recently by other Western spy agencies. It states that the hackers behind WannaCry are also called “the Lazarus Group,” a name used by private-sector researchers. One of the agencies reported that a prototype of WannaCry ransomware was found this spring in a non-Western bank. That data point was a “building block” for the North Korea assessment, the individual said. Honestly, I don’t know what to think. I am skeptical, but I am willing to be convinced. (Here’s the grugq, also trying to figure it out.) What I would like to see is the NSA evidence in more detail than they’re probably comfortable releasing. This piece by Bruce Schneier needs debunking. I thought I’d list the things wrong with it. When the US government discovers a vulnerability in a piece of software, however, it decides between two competing equities. It can keep it secret and use it offensively, to gather foreign intelligence, help execute search warrants, or deliver malware. Or it can alert the software vendor and see that the vulnerability is patched, protecting the country — and, for that matter, the world — from similar attacks by foreign governments and cybercriminals. It’s an either-or choice. The government doesn’t “discover” vulnerabilities accidentally. Instead, when the NSA has a need for something specific, it acquires the 0day, either through internal research or (more often) buying from independent researchers. The value of something is what you are willing to pay for it. If the NSA comes across a vulnerability accidentally, then the value to them is nearly zero. Obviously such vulns should be disclosed and fixed. Conversely, if the NSA is willing to pay $1 million to acquire a specific vuln for imminent use against a target, the offensive value is much greater than the fix value. What Schneier is doing is deliberately confusing the two, combing the policy for accidentally found vulns with deliberately acquired vulns. When the government discovers a vulnerability accidentally, it then decides to alert the software vendor to get it patched. When the government decides it needs as vuln for a specific offensive use, it acquires one that meets its needs, uses it, and keeps it secret. After spending so much money acquiring an offensive vuln, it would obviously be stupid to change this decision and not use it offensively. Schneier also says the NSA is “hoarding” vulns. The word has a couple inaccurate connotations. One connotation is that the NSA is putting them on a heap inside a vault, not using them. The opposite is true: the NSA only acquires vulns it for which it has an active need. It uses pretty much all the vulns it acquires. That can be seen in the ShadowBroker dump, all the vulns listed are extremely useful to attackers, especially ETERNALBLUE. Efficiency is important to the NSA. Your efficiency is your basis for promotion. There are other people who make their careers finding waste in the NSA. If you are hoarding vulns and not using them, you’ll quickly get ejected from the NSA. Another connotation is that the NSA is somehow keeping the vulns away from vendors. That’s like saying I’m hoarding naked selfies of myself. Yes, technically I’m keeping them away from you, but it’s not like they ever belong to you in the first place. The same is true the NSA. Had it never acquired the ETERNALBLUE 0day, it never would’ve been researched, never found. Schneier describes the “Vulnerability Equities Process” or “VEP”, a process that is supposed to manage the vulnerabilities the government gets. There’s no evidence the VEP process has ever been used, at least not with 0days acquired by the NSA. The VEP allows exceptions for important vulns, and all the NSA vulns are important, so all are excepted from the process. Since the NSA is in charge of the VEP, of course, this is at the sole discretion of the NSA. Thus, the entire point of the VEP process goes away. Moreover, it can’t work in many cases. The vulns acquired by the NSA often come with clauses that mean they can’t be shared. One reason sellers forbid 0days from being shared is because they use new classes of vulnerabilities, such that sharing one 0day will effectively ruin a whole set of vulnerabilities. Schneier poo-poos this because he doesn’t see new classes of vulns in the ShadowBroker set. This is wrong for two reasons. The first is that the ShadowBroker 0days are incomplete. There’s no iOS exploits, for example, and we know that iOS is a big target of the NSA. Secondly, I’m not sure we’ve sufficiently analyzed the ShadowBroker exploits yet to realize there may be a new class of vuln. It’s easy to miss the fact that a single bug we see in the dump may actually be a whole new class of vulnerability. In the past, it’s often been the case that a new class was named only after finding many examples. In any case, Schneier misses the point denying new classes of vulns exist. He should instead use the point to prove the value of disclosure, that instead of playing wack-a-mole fixing bugs one at a time, vendors would be able to fix whole classes of bugs at once. Schneier cites two studies that looked at how often vulnerabilities get rediscovered. In other words, he’s trying to measure the likelihood that some other government will find the bug and use it against us. These studies are weak, scarcely better than anecdotal evidence. Schneier’s own study seems almost unrelated to the problem, and the Rand’s study cannot be replicated, as it relies upon private data. Also, there is little differentiation between important bugs (like SMB/MSRPC exploits and full-chain iOS exploits) and lesser bugs. Whether from the Rand study or from anecdotes, we have good reason to believe that the longer an 0day exists, the less likely it’ll be rediscovered. Schneier argues that vulns should only be used for 6 months before being disclosed to a vendor. Anecdotes suggest otherwise, that if it hasn’t been rediscovered in the first year, it likely won’t ever be. The Rand study was overwhelmingly clear on the issue that 0days are dramatically more likely to become obsolete than be rediscovered. The latest update to iOS will break an 0day, rather than somebody else rediscovering it. Win10 adoption will break older SMB exploits faster than rediscovery. In any case, this post is about ETERNALBLUE specifically. What we learned from this specific bug is that it was used for at least 5 year without anybody else rediscovering it (before it was leaked). Chances are good it never would’ve been rediscovered, just made obsolete by Win10. All disclosure has the potential of leading to worms like WannaCry. The Conficker worm of 2008, for example, was written after Microsoft patched the underlying vulnerability. Thus, had the NSA disclosed the bug in the normal way, chances are good it still would’ve been used for worming ransomware. Yes, WannaCry had a head-start because ShadowBrokers published a working exploit, but this doesn’t appear to have made a difference. The Blaster worm (the first worm to compromise millions of computers) took roughly the same amount of time to create, and almost no details were made public about the vulnerability, other than the fact it was patched. (I know from personal experience — we used diff to find what changed in the patch in order to reverse engineer the 0day). In other words, the damage the NSA is responsible for isn’t really the damage that came after it was patched — that was likely to happen anyway, as it does with normal vuln disclosure. Instead, the only damage the NSA can truly be held responsible for is the damage ahead of time, such as the months (years?) the ShadowBrokers possessed the exploits before they were patched. One thing we’ve learned from 30 years of disclosure is that vendors ignore bugs. We’ve gotten to the state where a few big companies like Microsoft and Apple will actually fix bugs, but the vast majority of vendors won’t. Even Microsoft and Apple have been known to sit on tricky bugs for over a year before fixing them. And the only reason Microsoft and Apple have gotten to this state is because we, the community, bullied them into it. When we disclose bugs to them, we give them a deadline when we make the bug public, whether or not its been fixed. The same goes for the NSA. If they quietly disclose bugs to vendors, in general, they won’t be fixed unless the NSA also makes the bug public within a certain time frame. Either Schneier has to argue that the NSA should do such public full-disclosures, or argue that disclosures won’t always lead to fixes. The ETERNALBLUE vuln is so valuable to the NSA that it’s almost certainly seeking a replacement. Again, I’m trying to debunk the impression Schneier tries to form that somehow the NSA stumbled upon ETERNALBLUE by accident to begin with. The opposite is true: remote exploits for the SMB (port 445) or MSRPC (port 135) services are some of the most valuable vulns, and the NSA will work hard to acquire them. The only issue here is that the 0day leaked. If the NSA can’t keep it’s weaponized toys secret, then maybe it shouldn’t have them. Instead of processing this new piece of information, which is important, Schneier takes this opportunity to just re-hash the old inaccurate and deceptive VEP debate. Except for a tiny number of people working for the NSA, none of us really know what’s going on with 0days inside government. Schneier’s comments seem more off-base than most. Like all activists, he deliberately uses language to deceive rather than explain (like “discover” instead of “acquire”). Like all activists, he seems obsessed with the VEP, even though as far as anybody can tell, it’s not used for NSA acquired vulns. He deliberate ignores things he should be an expert in, such as how all patches/disclosures sometimes lead to worms/exploits, and how not all disclosure leads to fixes. There is plenty of blame to go around for the WannaCry ransomware that spread throughout the Internet earlier this month, disrupting work at hospitals, factories, businesses, and universities. First, there are the writers of the malicious software, which blocks victims’ access to their computers until they pay a fee. Then there are the users who didn’t install the Windows security patch that would have prevented an attack. A small portion of the blame falls on Microsoft, which wrote the insecure code in the first place. One could certainly condemn the Shadow Brokers, a group of hackers with links to Russia who stole and published the National Security Agency attack tools that included the exploit code used in the ransomware. But before all of this, there was the NSA, which found the vulnerability years ago and decided to exploit it rather than disclose it. All software contains bugs or errors in the code. Some of these bugs have security implications, granting an attacker unauthorized access to or control of a computer. These vulnerabilities are rampant in the software we all use. A piece of software as large and complex as Microsoft Windows will contain hundreds of them, maybe more. These vulnerabilities have obvious criminal uses that can be neutralized if patched. Modern software is patched all the time — either on a fixed schedule, such as once a month with Microsoft, or whenever required, as with the Chrome browser. This is all well-trod ground, and in 2010 the US government put in place an interagency Vulnerabilities Equities Process (VEP) to help balance the trade-off. The details are largely secret, but a 2014 blog post by then President Barack Obama’s cybersecurity coordinator, Michael Daniel, laid out the criteria that the government uses to decide when to keep a software flaw undisclosed. The post’s contents were unsurprising, listing questions such as “How much is the vulnerable system used in the core Internet infrastructure, in other critical infrastructure systems, in the US economy, and/or in national security systems?” and “Does the vulnerability, if left unpatched, impose significant risk?” They were balanced by questions like “How badly do we need the intelligence we think we can get from exploiting the vulnerability?” Elsewhere, Daniel has noted that the US government discloses to vendors the “overwhelming majority” of the vulnerabilities that it discovers — 91 percent, according to NSA Director Michael S. Rogers. The particular vulnerability in WannaCry is code-named EternalBlue, and it was discovered by the US government — most likely the NSA — sometime before 2014. The Washington Post reported both how useful the bug was for attack and how much the NSA worried about it being used by others. It was a reasonable concern: many of our national security and critical infrastructure systems contain the vulnerable software, which imposed significant risk if left unpatched. And yet it was left unpatched. There’s a lot we don’t know about the VEP. The Washington Post says that the NSA used EternalBlue “for more than five years,” which implies that it was discovered after the 2010 process was put in place. It’s not clear if all vulnerabilities are given such consideration, or if bugs are periodically reviewed to determine if they should be disclosed. That said, any VEP that allows something as dangerous as EternalBlue — or the Cisco vulnerabilities that the Shadow Brokers leaked last August to remain unpatched for years isn’t serving national security very well. As a former NSA employee said, the quality of intelligence that could be gathered was “unreal.” But so was the potential damage. The NSA must avoid hoarding vulnerabilities. Perhaps the NSA thought that no one else would discover EternalBlue. That’s another one of Daniel’s criteria: “How likely is it that someone else will discover the vulnerability?” This is often referred to as NOBUS, short for “nobody but us.” Can the NSA discover vulnerabilities that no one else will? Or are vulnerabilities discovered by one intelligence agency likely to be discovered by another, or by cybercriminals? In the past few months, the tech community has acquired some data about this question. In one study, two colleagues from Harvard and I examined over 4,300 disclosed vulnerabilities in common software and concluded that 15 to 20 percent of them are rediscovered within a year. Separately, researchers at the Rand Corporation looked at a different and much smaller data set and concluded that fewer than six percent of vulnerabilities are rediscovered within a year. The questions the two papers ask are slightly different and the results are not directly comparable (we’ll both be discussing these results in more detail at the Black Hat Conference in July), but clearly, more research is needed. People inside the NSA are quick to discount these studies, saying that the data don’t reflect their reality. They claim that there are entire classes of vulnerabilities the NSA uses that are not known in the research world, making rediscovery less likely. This may be true, but the evidence we have from the Shadow Brokers is that the vulnerabilities that the NSA keeps secret aren’t consistently different from those that researchers discover. And given the alarming ease with which both the NSA and CIA are having their attack tools stolen, rediscovery isn’t limited to independent security research. But even if it is difficult to make definitive statements about vulnerability rediscovery, it is clear that vulnerabilities are plentiful. Any vulnerabilities that are discovered and used for offense should only remain secret for as short a time as possible. I have proposed six months, with the right to appeal for another six months in exceptional circumstances. The United States should satisfy its offensive requirements through a steady stream of newly discovered vulnerabilities that, when fixed, also improve the country’s defense. The VEP needs to be reformed and strengthened as well. A report from last year by Ari Schwartz and Rob Knake, who both previously worked on cybersecurity policy at the White House National Security Council, makes some good suggestions on how to further formalize the process, increase its transparency and oversight, and ensure periodic review of the vulnerabilities that are kept secret and used for offense. This is the least we can do. A bill recently introduced in both the Senate and the House calls for this and more. In the case of EternalBlue, the VEP did have some positive effects. When the NSA realized that the Shadow Brokers had stolen the tool, it alerted Microsoft, which released a patch in March. This prevented a true disaster when the Shadow Brokers exposed the vulnerability on the Internet. It was only unpatched systems that were susceptible to WannaCry a month later, including versions of Windows so old that Microsoft normally didn’t support them. Although the NSA must take its share of the responsibility, no matter how good the VEP is, or how many vulnerabilities the NSA reports and the vendors fix, security won’t improve unless users download and install patches, and organizations take responsibility for keeping their software and systems up to date. That is one of the important lessons to be learned from WannaCry. This essay originally appeared in Foreign Affairs. The old adage “Backing up your data is important to plan for, as hard drives inevitably fail.” is as true as ever, but equally true now is the need to backup your data to thwart the increasing frequency of ransomware attacks. Ransomware is malicious software that blocks access to your data, by encrypting files, until a ransom is paid. Once the ransom is paid, if you’re lucky, a decryption key is provided to the victim(s) to decrypt and access files. Ransomware comes in two not-so-fun flavors: Encryptors and lockers. Encryptors incorporate advanced encryption algorithms to block system files until a ransom is paid. Lockers do as the name implies, locking victims out of their operating system. This makes it impossible to access applications, files and even the desktop until a ransom is paid. Encryptors, also known as crypto-ransomware, are the most widespread type of ransomware. One of the more frustrating aspects of ransomware is that even if you’re careful to avoid it by not clicking on suspicious attachments, someone else’s infected computer might spread the malware to your computer over a shared network. WannaCry, a cryptoworm, spread in this fashion during the May 2017 ransomware attack. If you’re a current subscriber of Backblaze, there’s good news: Since Backblaze is continuously running online backup of your data, you can circumvent the need to pay a ransom by accessing and restore your files from your Backblaze backup. If you’re new to Backblaze there is no time like the present to backup. 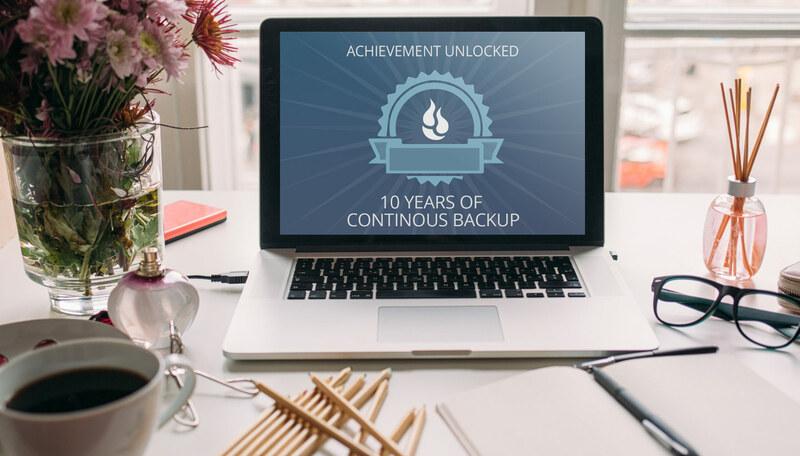 Over the past 10 years, through our annual backup survey, we’ve consistently found that most people fail to regularly backup their data. 25% never backup and nearly 67% have not backed up in the last year. With so few people backing up, it is no wonder that ransomware is so effective. Install Backblaze, if you haven’t already, on your computer. Make sure your Backblaze client is running and backing up your drive(s). At first notice of ransomware infecting your computer disable the Backblaze client temporarily. Login to Backblaze.com, “turn back time” for up to 30 days before the attack happened, access individual or all your files online, and/or request a full data restore via our Restore By Mail service. Now that you’re armed with this knowledge, don’t let ransomware get the best of you. The post Data Backup: Minimizing The Impact of Ransomware appeared first on Backblaze Blog | Cloud Storage & Cloud Backup. This is the 10th year Backblaze has designated June as Backup Awareness Month. It is also the 10th year of our annual Backup Awareness Survey. Each year, the survey has asked the question; “How often do you backup all of the data on your computer?” As they have done since the beginning, the good folks at Harris Interactive have conducted the survey, captured and tabulated the answers, and provided us with the results. Let’s take a look at what 10 years worth of surveys can tell us about computer backup. Let’s start with 2017 and see how computer owners answered our question. The most popular answer is “Yearly” at 26.3%. The least popular choice was “Daily” at just 9.3%. The difference between those two extremes can be easily calculated in days, but consider how much more data would be lost if you had backed up 364 days ago versus just 23 hours ago. How many photos, videos, spreadsheets, tax documents, and more would be lost when your computer crashed, or was stolen, or was attacked by ransomware like Wannacry or Cryptolocker. The longer the time between backups, the higher the risk of losing data. With 10 years worth of data, we have the opportunity to see if attitudes, or more appropriately actions, have changed with regards to how often people backup their data. 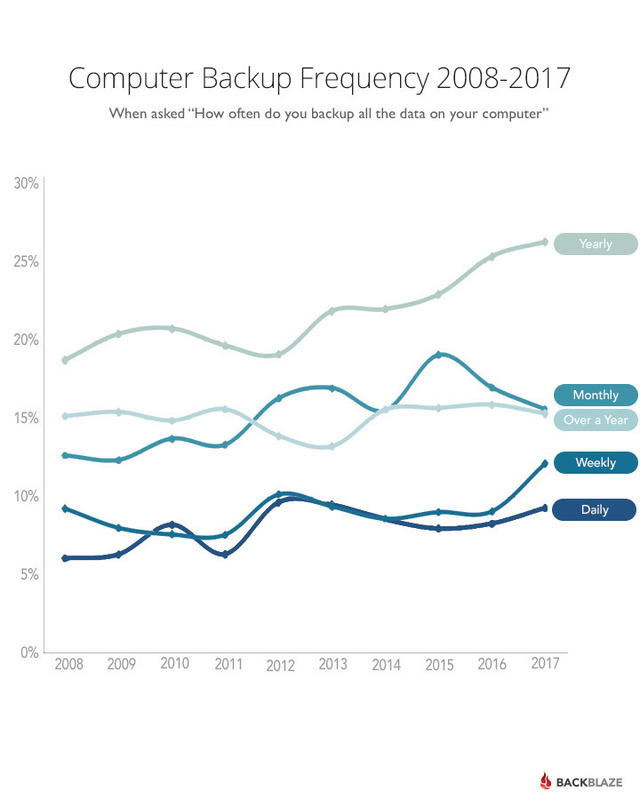 In general, more people seem to be backing up as all of the individual backup periods; daily, weekly, monthly, etc., are either the same or increasing their individual percentages over time. The chart below highlights the good news. We are winning! 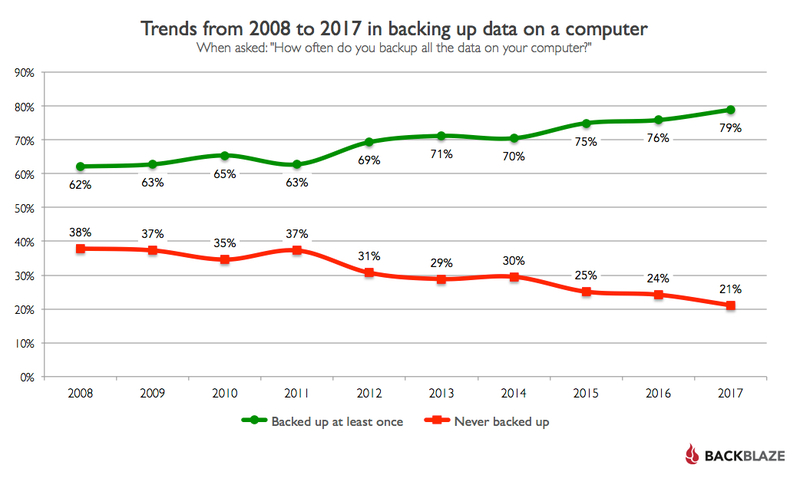 Over the 10-year period, more people are backing up all the data on their computer, at least once. From a low of 62% in 2008, the percentage of people who have backed up their computer has risen to 79% in 2017, a 27% increase over 10 years. OK, so its not amazing growth, but we’ll take it. Each survey provides interesting insights into the attributes of backup fiends and backup slackers. Here are a few facts from the 2017 survey. 91% of Americans don’t backup their computers at least once a day. 21% of Americans have never backed up all the data on their computers. 17% of American males have never backed up all the data on their computers. 25% of American females have never backed up all the data on their computers. 97% of American students (18+) that have a computer, don’t back it up daily. 87% of American college graduates that have a computer, don’t back it up daily – I guess that 10% of them learned something in college. 2016 – Data Backup: Are You a Hero or a Zero? 2012 – 10% now back up daily, 90% to go! Why a whole month for backup awareness? There’s a theory in human behavior that says in order for something to become a habit, you have to do it consistently for at least three weeks. To make backing up your computer a habit, remind yourself each day in June to backup your computer. Tie a string around your finger or set a reminder on your phone, whatever it takes so that you remember to backup your computer each day in June. Of course, the three-week theory is considered unproven and “your mileage may vary”, but at least you’ll be backed up during the month of June. Maybe, instead of trying to create a new daily backup habit, perhaps you could use a computer application. I’ll bet if you looked hard enough, you could find a computer program for your Mac or PC that would automatically remember to backup your computer each day – or even more often. That would awesome, right? Yes it would. The surveys were conducted online within the United States by Harris Interactive on behalf of Backblaze as follows: May 19-23, 2017 among 2048 U.S. adults, May 13-17, 2016 among 2,012 U.S. adults, May 15-19, 2015 among 2,090 U.S. adults, June 2-4, 2014 among 2,037 U.S. adults, June 13–17, 2013 among 2,021 U.S. adults, May 31–June 4, 2012 among 2,209 U.S. adults, June 28–30, 2011 among 2,257 U.S. adults, June 3–7, 2010 among 2,071 U.S. adults, May 13–14, 2009 among 2,185 U.S. adults, and May 27–29, 2008 among 2,761 U.S. adults. In all surveys, respondents consisted of U.S. adult computer users (aged 18+), weighted to the U.S. adult population of computer users. These online surveys are not based on a probability sample and therefore no estimate of theoretical sampling error can be calculated. 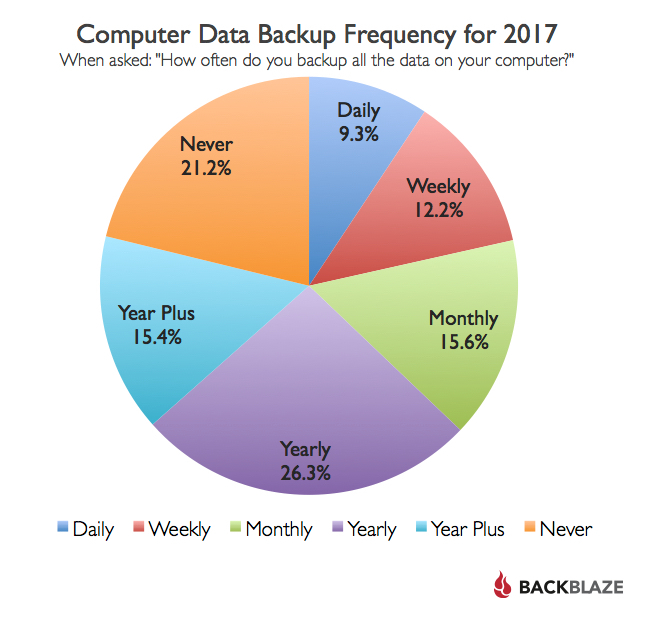 The post Backup Awareness Survey, Our 10th Year appeared first on Backblaze Blog | Cloud Storage & Cloud Backup. In 2013, a mysterious group of hackers that calls itself the Shadow Brokers stole a few disks full of NSA secrets. Since last summer, they’ve been dumping these secrets on the Internet. They have publicly embarrassed the NSA and damaged its intelligence-gathering capabilities, while at the same time have put sophisticated cyberweapons in the hands of anyone who wants them. They have exposed major vulnerabilities in Cisco routers, Microsoft Windows, and Linux mail servers, forcing those companies and their customers to scramble. And they gave the authors of the WannaCry ransomware the exploit they needed to infect hundreds of thousands of computer worldwide this month. After the WannaCry outbreak, the Shadow Brokers threatened to release more NSA secrets every month, giving cybercriminals and other governments worldwide even more exploits and hacking tools. Who are these guys? And how did they steal this information? The short answer is: we don’t know. But we can make some educated guesses based on the material they’ve published. The Shadow Brokers suddenly appeared last August, when they published a series of hacking tools and computer exploits­ — vulnerabilities in common software — ­from the NSA. The material was from autumn 2013, and seems to have been collected from an external NSA staging server, a machine that is owned, leased, or otherwise controlled by the US, but with no connection to the agency. NSA hackers find obscure corners of the Internet to hide the tools they need as they go about their work, and it seems the Shadow Brokers successfully hacked one of those caches. In total, the group has published four sets of NSA material: a set of exploits and hacking tools against routers, the devices that direct data throughout computer networks; a similar collection against mail servers; another collection against Microsoft Windows; and a working directory of an NSA analyst breaking into the SWIFT banking network. Looking at the time stamps on the files and other material, they all come from around 2013. The Windows attack tools, published last month, might be a year or so older, based on which versions of Windows the tools support. The releases are so different that they’re almost certainly from multiple sources at the NSA. The SWIFT files seem to come from an internal NSA computer, albeit one connected to the Internet. The Microsoft files seem different, too; they don’t have the same identifying information that the router and mail server files do. The Shadow Brokers have released all the material unredacted, without the care journalists took with the Snowden documents or even the care WikiLeaks has taken with the CIA secrets it’s publishing. They also posted anonymous messages in bad English but with American cultural references. Given all of this, I don’t think the agent responsible is a whistleblower. While possible, it seems like a whistleblower wouldn’t sit on attack tools for three years before publishing. They would act more like Edward Snowden or Chelsea Manning, collecting for a time and then publishing immediately­ — and publishing documents that discuss what the US is doing to whom. That’s not what we’re seeing here; it’s simply a bunch of exploit code, which doesn’t have the political or ethical implications that a whistleblower would want to highlight. The SWIFT documents are records of an NSA operation, and the other posted files demonstrate that the NSA is hoarding vulnerabilities for attack rather than helping fix them and improve all of our security. I also don’t think that it’s random hackers who stumbled on these tools and are just trying to harm the NSA or the US. Again, the three-year wait makes no sense. These documents and tools are cyber-Kryptonite; anyone who is secretly hoarding them is in danger from half the intelligence agencies in the world. Additionally, the publication schedule doesn’t make sense for the leakers to be cybercriminals. 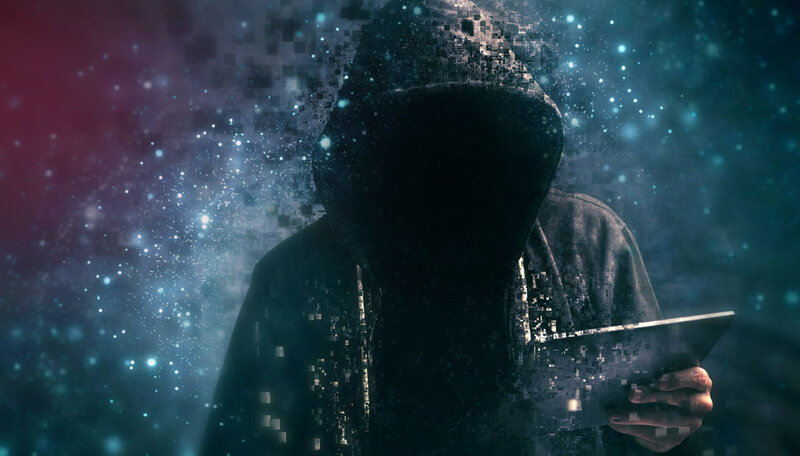 Criminals would use the hacking tools for themselves, incorporating the exploits into worms and viruses, and generally profiting from the theft. That leaves a nation state. Whoever got this information years before and is leaking it now has to be both capable of hacking the NSA and willing to publish it all. Countries like Israel and France are capable, but would never publish, because they wouldn’t want to incur the wrath of the US. Country like North Korea or Iran probably aren’t capable. (Additionally, North Korea is suspected of being behind WannaCry, which was written after the Shadow Brokers released that vulnerability to the public.) As I’ve written previously, the obvious list of countries who fit my two criteria is small: Russia, China, and­ — I’m out of ideas. And China is currently trying to make nice with the US. It was generally believed last August, when the first documents were released and before it became politically controversial to say so, that the Russians were behind the leak, and that it was a warning message to President Barack Obama not to retaliate for the Democratic National Committee hacks. Edward Snowden guessed Russia, too. But the problem with the Russia theory is, why? These leaked tools are much more valuable if kept secret. Russia could use the knowledge to detect NSA hacking in its own country and to attack other countries. By publishing the tools, the Shadow Brokers are signaling that they don’t care if the US knows the tools were stolen. Sure, there’s a chance the attackers knew that the US knew that the attackers knew — ­and round and round we go. But the “we don’t give a damn” nature of the releases points to an attacker who isn’t thinking strategically: a lone hacker or hacking group, which clashes with the nation-state theory. This is all speculation on my part, based on discussion with others who don’t have access to the classified forensic and intelligence analysis. Inside the NSA, they have a lot more information. Many of the files published include operational notes and identifying information. NSA researchers know exactly which servers were compromised, and through that know what other information the attackers would have access to. As with the Snowden documents, though, they only know what the attackers could have taken and not what they did take. But they did alert Microsoft about the Windows vulnerability the Shadow Brokers released months in advance. Did they have eavesdropping capability inside whoever stole the files, as they claimed to when the Russians attacked the State Department? We have no idea. So, how did the Shadow Brokers do it? Did someone inside the NSA accidentally mount the wrong server on some external network? That’s possible, but seems very unlikely for the organization to make that kind of rookie mistake. Did someone hack the NSA itself? Could there be a mole inside the NSA? If it is a mole, my guess is that the person was arrested before the Shadow Brokers released anything. No country would burn a mole working for it by publishing what that person delivered while he or she was still in danger. Intelligence agencies know that if they betray a source this severely, they’ll never get another one. That points to two possibilities. The first is that the files came from Hal Martin. He’s the NSA contractor who was arrested in August for hoarding agency secrets in his house for two years. He can’t be the publisher, because the Shadow Brokers are in business even though he is in prison. But maybe the leaker got the documents from his stash, either because Martin gave the documents to them or because he himself was hacked. The dates line up, so it’s theoretically possible. There’s nothing in the public indictment against Martin that speaks to his selling secrets to a foreign power, but that’s just the sort of thing that would be left out. It’s not needed for a conviction. If the source of the documents is Hal Martin, then we can speculate that a random hacker did in fact stumble on it — ­no need for nation-state cyberattack skills. There was a second, previously undisclosed breach of cybertools, discovered in the summer of 2015, which was also carried out by a TAO employee [a worker in the Office of Tailored Access Operations], one official said. That individual also has been arrested, but his case has not been made public. The individual is not thought to have shared the material with another country, the official said. Of course, “not thought to have” is not the same as not having done so. It is interesting that there have been no public arrests of anyone in connection with these hacks. If the NSA knows where the files came from, it knows who had access to them — ­and it’s long since questioned everyone involved and should know if someone deliberately or accidentally lost control of them. I know that many people, both inside the government and out, think there is some sort of domestic involvement; things may be more complicated than I realize. Whoever the Shadow Brokers are, however they stole these disks full of NSA secrets, and for whatever reason they’re releasing them, it’s going to be a long summer inside of Fort Meade­ — as it will be for the rest of us. This essay previously appeared in the Atlantic, and is an update of this essay from Lawfare. Agency (NSA), should give one pause. Не. Няма да пиша за ИскаПлаче. Вече много се изписа – и както обикновено малка част си струваше четенето. Проблемът е много по-голям от раздуханата случка. А резюмето е, че сме прецакани. Генерално сме прецакани! Нещо, което си повтаряме от време на време из технологичните среди, но е крайно време да го обясним с човешки думи на всички и да започнем някак да поправяме нещата. Интернет е лабораторно чедо. Няма някакъв съвършен имунитет. Роди се и проходи в среда на академична романтика, обгрижвано с наивната добронамереност на първосъздателите и първопотребителите си. До скоро (в Интернет) все още беше донякъде вярно, че мнозинството по принцип е рационално, що-годе грамотно, а полезното и смисленото естествено ще надделяват над глупостта и враждебността. Вече не е така. Приказката свърши! Време е да се събудим и да признаем, че доброто няма да победи злото по подразбиране, без да му помогнем. Свързани сме. Всички. Повече от всякога. И затова трябва да осъзнаваме отговорността си един към друг. Както когато сме пипнали грип, не си стоим вкъщи само за да се излекуваме по-бързо, а и за да ограничим заразата сред останалите – така и не можем в наши дни да си позволим да ползваме компютър, смартфон и софтуер, който е стар и изоставен от поддръжка – защото сме уязвими не само ние, но застрашаваме и останалите. Системите, които ползваме явно или невидимо около нас, ще стават все по-свързани и отговорността да ги опазим е обща. Тя включва и да изискваме отговорност – от себе си, от операторите, от правителствата. WannaCry нямаше да има този ефект, ако пострадалите бяха обновили софтуера си. Затова, когато на телефона или какъвто и да е компютър или умно устройство изгрее обновление, за бога, не го пренебрегвайте! Да, понякога може да е досадно. Не е много забавно и да си миеш зъбите, но е силно препоръчително и полезно за здравето. Но… дори и от утре всички да започнем стриктно да спазваме това, то пак няма да е достатъчно, ако срещу себе си имаме правителства и организации, които злоупотребяват. WannaCry е производна на уязвимост в Windows, която Агенцията за сигурност на Съединените щати е открила, но вместо да уведоми за това Microsoft, неясно колко време се е възползвала от нея, за да прониква в чужди системи и да проследява и краде данни от тях. Кракерска групировка ги открадна пък от тях преди време, публикува присвоения арсенал – и ето – бързо се намери някой, който да го използва с користна цел. Такива случки тепърва ще зачестяват. И ако правителствата ни играят срещу нас… няма да е никак весело. Нужна е глобална, масова и упорита съпротива срещу практиката да се пазят в тайна уязвимости. Играем и една друга рискована игра. Ежедневно. С великодушно безразличие за мащаба и ефекта на проблема. Смартфоните и таблетите ни също са компютри, а огромна част от производителите им, увлечени от стремежа за повече продажби на нови модели, бързат да „пенсионират“ старите, спирайки обновленията за тях, притискайки клиентите си да сменят устройството си. Това обаче не се случва така, както на производителите им се иска, и по-старите устройства продължават да бъдат ползвани без обновления, с уязвимости, препродават се на вторичен пазар, преотстъпват се на деца, роднини или по-възрастни хора. Докато един ден… нещо като WannaCry ще направи и от това новина… или тихо ще отмъква данни – телефонни номера, съобщения, снимки, пароли, кредитни карти, всевъзможна лична информация… И понеже сме толкова свързани – ще пострадат не само притежателите на пробити устройства, а косвено и тези, с които те са в някакви взаимоотношения. Най-лошият пример са старите телефони и таблети с Android, за които Google няма механизъм да принуди производителите им да се грижат по-добре и по-адекватно и продължително за тях. Огледайте се около себе си и вижте колко ваши познати използват много стари устройства. За кошмарната сигурност на доста IoT джаджи за автоматизация и управление на умни домове и производства дори не ми се отваря тема. Но като споменах Google… Необходим ни е нов, променен Интернет! Централизираният модел на гигантски силози с информация, които пълним всички, но контрол върху тях имат малцина, е фундаментално сбъркан. И тук проблемът не опира само до сигурност, защото пробив в такава система директно се проектира върху много хора, които разчитат на нея. Имаме и вторичен, но много сериозен проблем, свързан със зависимостта ни от нея и злоупотребата с данните ни там. Подхлъзвайки ни да ползваме „безплатните“ услуги на Google, Facebook и подобните им… те ни обричат на зависимост и контрол. Елегантно се оказва, че данните, които им поверяваме, не са наши данни, а техни. Те ги използват, за да ни профилират, да отгатват интересите ни, темите към които имаме чувствителност, манипулират ни с тях, продават ги, за да ни манипулират и други. Това е цената на „безплатното“. И борбата за тях (трябва да) е непрекъсната. Трябва да си върнем контрола върху дигиталното ни Аз в Интернет. Да редуцираме до минимум използването на безплатни услуги, които събират данни. Да приемем грижата за сигурността на софтуера и устройствата ни като част от личната ни хигиена. Да възпитаваме чувствителност към манипулациите в Интернет и особено към фалшивите новини и некачествената журналистика. Да настояваме за прозрачност от правителствата, организациите, политиците и корпорациите. Да използваме по-малки, децентрализирани платформи (медийни, за услуги, за комуникация) и да ги подкрепяме финансово, а когато можем – и да стартираме собствени такива. Да надвиваме индивидуализма си и да се подкрепяме взаимно в общността си. Бъдещето принадлежи не на големите мастодонти, а на мрежи от малки, взаимносвързани, независими и подкрепящи се проекти, които случваме заедно. Колкото по-рано осъзнаем тенденцията и силата си, толкова по-добре. Did North Korea Write WannaCry? The New York Times is reporting that evidence is pointing to North Korea as the author of the WannaCry ransomware. Note that there is no proof at this time, although it would not surprise me if the NSA knows the origins of this malware attack.